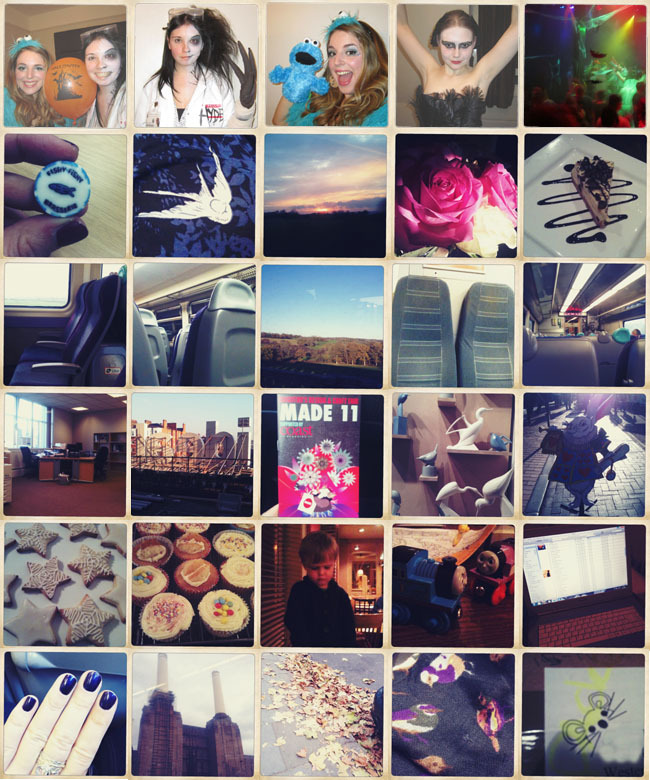 Halloween | Clare as Jekyll & Hyde | Me as the Cookie Monster | Ele as the Black Swan | Dancing to spooky tunes | Lovely fish meal for the bf's birthday | New dress - lovely print | Sunset | Sunlight through roses | Honeycomb-smash cheesecake... om nom nom | 10 hour train journey to Yorkshire and back | Behind the scenes at the Ideal Home Show | Made 2011 - Brighton | The White Rabbit in Brighton Lanes | Home baked star-shaped cookies | Home-baked cupcakes | My friend's toddler, growing up so fast | Thomas the Tank Engine| Sorting out my new iPhone 4S with iTunes | OPI Ink | London again | Autumn | Wrap up warm in a nice new scarf | Christmas gifts for friends & family start arriving! NB: If you would like a more detailed post on my Cookie Monster Halloween costume, please let me know in the comments. Halloween was so much fun. Your costume was fabulous darling! Again, really love these little snapshots.